The Spring+Summer Knitty Surprise went live at the end of last week. Didja see? Butterbloom is a lovely lace-bottomed short-sleeved sweater with a v-neck, designed by Cosmicpluto, aka Laura Chau. It’s designed in Mrs Crosby’s Train Case, which comes in the wonderful variety of colors Lorna’s Laces is famous for. Which color will you choose? 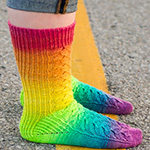 And for your tootsies, a beautiful pair of rainbow lace socks knit in Dragon Strings Phoenix Wing Gradient Shimmer. Carolyn Macpherson has created a beautiful bit of prose to go with the pattern too. Don’t miss the introduction. Our Wiseknit™ video column this issue is Kate Atherley’s take on Kitchener Stitch for stockinette, reverse stockinette and garter stitches. Kate has some great tips for you as she demonstrates all three techniques. Don’t forget to check the Cool Stuff page…we add new reviews in every Surprise! Ever wanted to wear a glitch? Now you can, thanks to knitting machine manufacturing company Stoll. Their Digital Knits line looks like what happens when a PC blows a gasket. Not only do they manufacture the machines, but they have created software that connects designer with the thing. “Stoll–Artwork is a brand new design tool that adds knitwear–specific features to adobe photoshop. 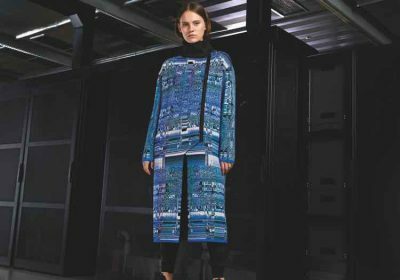 ‘Using features like automatic control tools and stitch distortion simulation, to name a few, the system helps the creation of artworks substantially easier for the knitwear designer,’ said Jörg Hartmann, head of Fashion & Technology for Stoll.